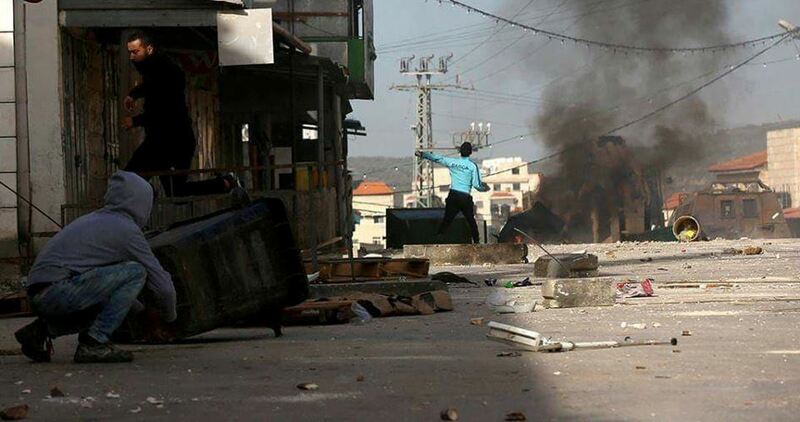 Violent clashes broke out last night and at dawn Saturday between Palestinian young men and Israeli soldiers in different areas of Jenin and al-Khalil. In Jenin, the clashes started after soldiers stormed Misilyah town, closed its main entrance and embarked on interrogating local residents on its streets. Local sources told the Palestinian Information Center (PIC) that local youths hurled stones at the soldiers who responded by indiscriminately and intensively firing tear gas grenades. Several tear gas canisters fell on homes in the town, causing many families, mostly children and women, to suffer from their exposure to fumes. In al-Khalil, overnight clashes with soldiers erupted and continued into the early morning hours of Saturday in different areas of al-Khalil city. Local sources reported that the events occurred after Israeli troops stormed al-Fawwar refugee camp and al-Salayma neighborhood in the Old City of al-Khalil as well as the nearby area of al-Darwa in Halhul city, and carried out raids on homes. They added that a large number of local young men in those areas confronted the troops and forced them to withdraw. Israeli occupation forces (IOF) on Saturday morning closed the main entrance to al-Fawwar refugee camp in al-Khalil, south of the West Bank. The PIC reporter said that the abrupt closure has disturbed the life of about 10,000 Palestinians living in the camp, adding that hundreds of cars are stuck on both sides of the entrance waiting to be allowed in or out. 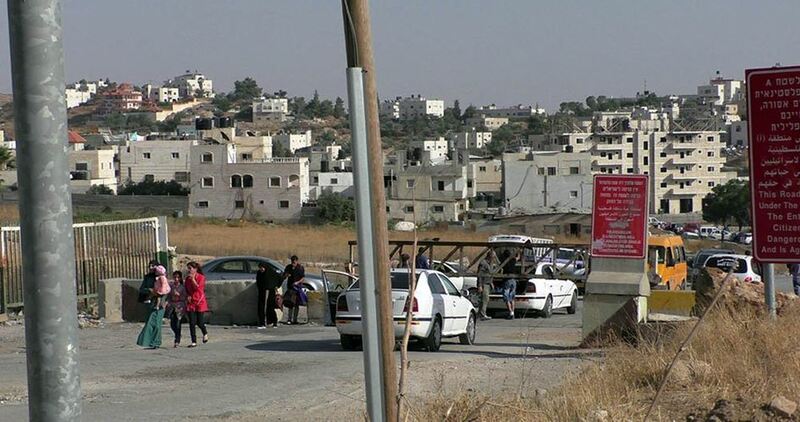 Businessmen, merchants, workers and university students were harassed and searched by the IOF soldiers who installed a military checkpoint near the entrance. Tension has flared up in the refugee camp since Friday night when the IOF stormed the camp and attacked Palestinian citizens who responded by throwing stones, empty bottles, and Molotov cocktails. No arrests have been reported so far. 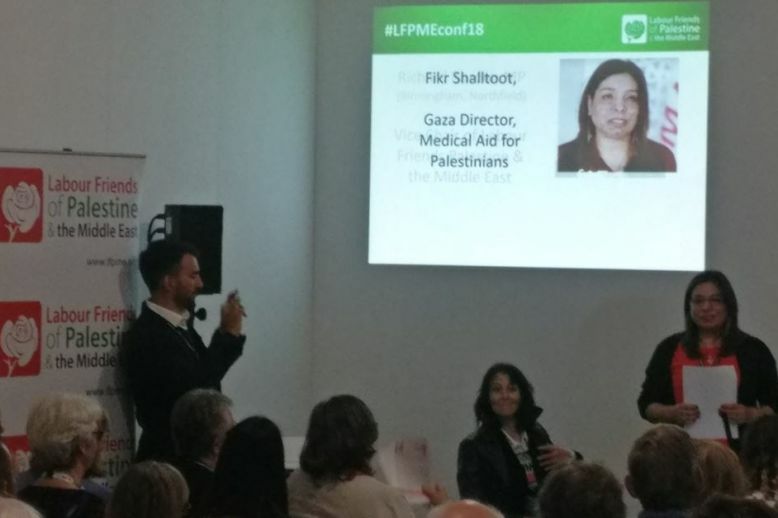 This week, Medical Aid for Palestinians (MAP) was at the Labour Party Conference in Liverpool speaking to Parliamentarians, delegates and the public about the humanitarian emergency in Gaza, and barriers to the right to health of Palestinians living under occupation and as refugees. MAP’s Director of Programmes in Gaza, Fikr Shalltoot, spoke at Labour Friends of Palestine and the Middle East’s (LFPME) fringe event titled ‘#ExistenceIsResistance – Supporting Palestine’s Next Generation’, chaired by Richard Burden MP, who had the week before been in the West Bank on a delegation with MAP and Caabu. Alongside Fikr on the panel were Chris Gunness, Spokesperson for UNRWA; Professor Karma Nabulsi, Associate Professor in Politics and International Relations at Oxford University; and Dr. Mezna Qato, Junior Research Fellow in Middle Eastern History at King’s College Cambridge. Fikr opened by discussing the severe movement restrictions Palestinians in Gaza face. She described her lengthy journey to get to conference, requiring a visa from the UK, a permit to exit Gaza from Israel and a non-objection letter from Jordan to fly out of Amman – a journey which took five days. Fikr stressed that, by being able to travel out of Gaza at all, she was “one of the lucky ones”. She reflected that Israel restricts the exit of all Palestinians from Gaza with few exceptions: business owners with permits, international NGO staff like herself, and urgent medical cases. “Being able to leave at all is rare for people in Gaza, and most young people have never left Gaza at all” she said. Approval of permits for members of these categories is far from guaranteed, however. With 48% of patients’ exit permit applications either denied or not responded to last year, Fikr stressed that restrictions can have serious consequences for those needing urgent medical care outside of Gaza. Following the event’s focus on the “next generation” in Palestine, Fikr described life for young people in Gaza: “We are two million people, half are under 15 years old. More than two-thirds are refugees, expelled from our former homes and lands in what was Palestine and is now Israel”. While around the world infant mortality has declined, in Gaza deaths among children aged one year or less have not declined since 2006 – covering the period of Israel’s closure. If a child gets ill and needs to be treated outside of Gaza, assuming they are able to get a permit to exit from the Israeli Authorities, they may have to do so without their mother or father by their side. In August 2018, almost half of all permit applications for patient companions – including parents trying to accompany their children to appointments for treatment in East Jerusalem or elsewhere in the West Bank – were denied or delayed by Israel. “This means that children’s wards in hospitals in East Jerusalem contain children going through scary treatments for diseases, such as cancer, without their parents with them,” said Fikr. “MAP – and some MPs here who have been on delegations with MAP and Caabu to the West Bank – see new-borns and neonate babies from Gaza in intensive care in Al Makassed Hospital separated for weeks and months from their mothers due to lack of a permit from the occupying power”. Fikr also outlined the mass casualties in Gaza as a result of Israeli military’s shocking use of force against demonstrators at the “Great March of Return”, and outlined how MAP is helping Gaza’s health sector to respond to complex limb injuries. Call on Israel to lift Gaza’s closure, in line with calls by UN bodies and the ICRC, and in particular lift restrictions on the movement of patients trying to get to treatment and health workers trying to get to training and opportunities in the West Bank, including East Jerusalem. MAP was also at the LFPME evening reception – see next week’s Monitor – and will have a stall and be hosting a meeting at the Scottish National Party Conference, on 8 October at the SEC in Glasgow (Confronting Gaza’s health emergency, with a focus on breast cancer: Dr Philippa Whitford MP, with Neil Sammonds, MAP, Boisdale Room 9am). If you are attending, see you there! JENIN, PALESTINOW.COM — Israeli soldiers invaded, on Friday at night, Misilyah village, south of the northern West Bank city of Jenin, and caused many Palestinians to suffer the effects of teargas inhalation, during protests the followed the invasion. Media sources said the soldiers fired many gas bombs at random, some striking homes, causing several Palestinians to suffer the effects of teargas inhalation. They added that the soldiers also installed a military roadblock at the junction of Qabatia town, south of Jenin, before stopping and searching dozens of cars, and interrogated many Palestinians while inspecting their ID cards. GAZA, PALESTINOW.COM — These days coincide with the anniversary of the outbreak of Al-Aqsa Intifada in 2000, which marked a turning point in the Palestinian cause, changing many equations. Due to its revolutionary action, the Israeli occupation withdrew from Gaza; initiating a new phase for the liberation of Palestine. The spark of the intifada broke out 18 years ago, after the Israeli war criminal, the leader of the Likud Party at the time, Ariel Sharon, along with Israeli settlers stormed the courtyards of Al-Aqsa Mosque, and tried to desecrate its yards and its symbolic place through their provocative actions. The Palestinian people faced this provocation with courage with their bare chests, providing examples of sacrifice and dignity, as they always did to protect Al-Aqsa Mosque and Jerusalem and the Palestinian cause as a whole. The Palestinian people faced Sharon’s intrusion into Al-Aqsa with strength and firmness, as dozens of martyrs and rivers of blood were scattered on the ground in expression of this spirit of resistance. The Palestinian people have proved that the stolen rights can only be restored through the united will of the people around the project of resistance and protection of rights. Al-Aqsa Intifada, or what is known as the Second Intifada, was characterized by frequent armed confrontations and escalating military actions between the Palestinian resistance and the occupation, in which 4,412 Palestinians were killed and 48,322 were injured. More than 1,000 Israeli soldiers and settlers were killed and more than 5,000 were wounded. The Palestinian resistance during Al-Aqsa Intifada passed through many stages. It started with a great popularity that swept through the Palestinian cities and towns. The Palestinian people participated in it, gradually starting clashes with the occupation soldiers at the entrances of towns and cities that led to the injury of many Palestinians in most of the provinces. The images of confrontations and throwing stones appeared on TVs, as the confrontations later led to the martyrdom and injury of many Palestinians in most of the provinces. The stage of military engagement, which slowly infiltrated the scene, began. There were some military clashes of individual resistance fighters, after which some military groups from the Palestinian factions led the path, and that period was a tidal wave between the Palestinian resistance and the occupation soldiers. The Palestinian response began to widen, and the circle of engagement began to affect the occupation soldiers and settlers at the main roadblocks and streets of the West Bank, as well as the storming of the settlements and carrying out military operations, which led to the spread of fear in the ranks of the occupation after the casualties they incurred. The resistance gradually developed with the continuation of the Intifada. The Palestinian factions were able to form military groups in most Palestinian cities. Their performance developed, and a new phase began in the conflict. This was the stage of the human-bombing attacks that constituted the greatest blow to the occupation. The scenes of buses, restaurants and charred hotels were the most prominent feature at that stage. The stage of human-bombing attacks continued during the Intifada’s early years, before another stage began to emerge. It was the rockets and mortars stage. The first Qassam rocket launched from Gaza towards a settlement was on 26 October 2001, which now is the most disturbing point for the occupation. The Palestinian resistance was characterized by several advantages imposed by the facts on the ground during Al-Aqsa Intifada, perhaps the most prominent of which was the leadership which was engaged in the battle and the Palestinian consensus on the resistance approach. The Palestinian factions and their leaders acted in the field. The Palestinian unity and the consensus on the resistance were the most prominent features among the Palestinians. The resistance was characterized by its durability over the years of the Intifada, and during the period of resistance and implementation, it relied on the abilities of its people, who invented various means and tools of resistance. Self-reliance was one of the characteristics of the resistance at the time. The direct and strong response of resistance to any Israeli violation and aggression was a prominent feature of the resistance approach, and it imposed certain deterrence to the occupation and its arrogance. With the development of martyrdom attacks and hitting the depth of the occupation, Israel began the construction of the separation wall in 2002, to limit these operations and infiltration of Palestinians and fighters to Jerusalem and the occupied lands. The Intifada was also marked by the assassination of several prominent Palestinian leaders, headed by the founder of the Islamic Resistance Movement (Hamas) Sheikh Ahmed Yassin, the leader of the movement Abdel Aziz Rantisi, in addition to the Secretary General of the Popular Front Abu Ali Mustafa, and the leader of the armed wing of the Palestinian National Liberation Movement (Fatah) Raed Al Karmi. The occupation destroyed the Palestinian infrastructure in the West Bank during the Intifada, while also causing heavy losses, the most striking of which was the tourism sector and the economy of Israeli settlements. This also led to destroying the notion of the invincible army, that Israel used to describe its army with, and the insecurity and instability in all areas of the Palestinian land, where the resistance benefited from the experience of resistance in the years of the Second Intifada, sending a message that the security of settlers is shaken and that the Palestinians do not fear the occupation or its army. It seems that the root of revolution, which was ignited by the Intifada, is being renewed. 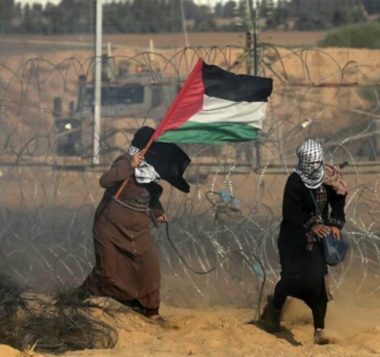 The Palestinian people continue to fight the enemy and to confront its aggressions and violations in Jerusalem, the West Bank, the Gaza Strip and in the 1948 Territories, as illustrated by the Great March of Return. Why did not Belgian prime minister ask Israeli occupation to immediately and unconditionally release Belgian citizen who has been in Israeli jails for a couple of months without trial? Since you are the highest rank and the most influential person within the Belgian government, I am writing to you about the dilemma of Mostapha Awad, 36, who is a Belgian citizen of Palestinian ancestry held in an Israeli prison for nearly two months. Mostapha was arrested on July 19th at the Allenby border crossing with Jordan. Israeli security officers questioned him because he was a peace activist and the co-founder of the popular debkeh (Palestinian dance) troupe Raj’een, which performed at numerous events in Belgium and across Europe. I urge you to intercede on behalf of Mostapha Awad to help secure his release. 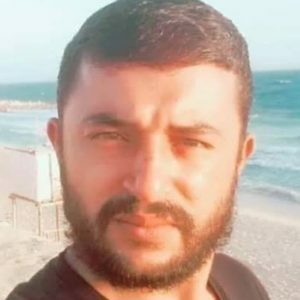 Israel is notorious for arresting Palestinians without charges and it often subject them to torture and forces them to sign a confession in Hebrew, even if they do not know the language. Mostapha’s family, who live in a refugee camp in south Lebanon, are not allowed to visit him. It is also time to show Israel some back bone by simply asking them to either charge or free Mostapha Awad as required under the Israeli law, as well as international law. 1. What evidence does Israel have that Awad has helped transfer funds from the PFLP in Syria and Lebanon to European activists? 2. Was any one of those European activists engaged in any illegal activities against their respective countries and or Israel? 3. 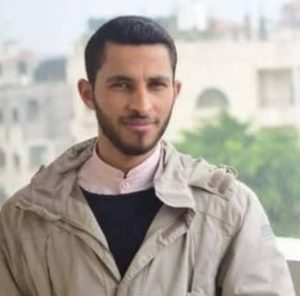 Since Awad arrived at Tel Aviv airport several years ago to visit his parents’ hometown north of the city of Akka, Palestine for the first time, why did Israel not arrest him then instead of denying him entry? 5. Did Mostapha sign any confession? Was it in Arabic or Hebrew language? Mostapha does not read or write Hebrew. 6. Let’s assume Awad was a member of the PFLP in Belgium; Israel still does not have a jurisdiction over another sovereign nation, such as yours. 7. If Israel detained Awad for being a member of the PFLP, would Israel contemplate to assassinate or kidnap the Palestinian resistance icon Leila Khaled who is a prominent PFLP leader? For those who are not in the know, in February 2011, five Israeli Mossad agents kidnapped Dirar Abu Sisi, the operational manager of Gaza’s only power plant, during his visit to Ukraine with his wife and six children. Abu Sisi was then smuggled out of Ukraine to an airplane and was taken to Israel. Speaking of EU citizens held illegally behind bars in Israel, I should share with you the story of a French-Palestinian lawyer and human rights defender Salah Hamouri who has been imprisoned without charge or trial for over a year. Salah Hamouri was arrested at his home in Jerusalem. His detention was ordered by Israeli War Minister Avigdor Lieberman, based on information available on the website of Samidoun, a Palestinian Prisoners Network. Like Mostapha Awad, Hamouri is also being held without charge, without any evidence of guilt and without any right to defense or trial. 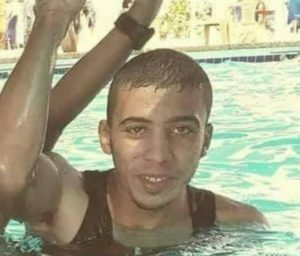 Those two Palestinians are held under administrative detention act (ADA), a policy under which Palestinians may be held indefinitely without charge or trial. Some Palestinians have been held under ADA in administrative detention for years. ADA is a procedure that allows the Israeli military to hold prisoners indefinitely on secret evidence without charging them or allowing them to stand trial. It is renewable every 6 month at the whim of the occupiers, a practice that was not even deployed during the Nazi era. Belgium should send a loud and clear message to Israel that it will stand strongly against ill treatment of its citizens and will use every available means to ensure the safety of its citizens. By demanding the immediate and unconditional release of one of your citizens, you are not asking the state of Israel for a FAVOR. 1) Last month, the US has imposed sanctions on Turkey’s justice and interior ministers over the continued detention of American pastor Andrew Brunson. Reverend Brunson has been held on espionage charges for nearly two years, but the White House believes he is a victim of unfair and unjust detention. 2) After the US government arrested and strip-searched an Indian diplomat in December 2013, the indecent triggered an uproar between the US and India. The Indian diplomat was charged in New York with visa fraud related to her treatment of her housekeeper. The diplomat was arrested outside her daughter’s school. India’s Prime Minister called the diplomat’s treatment “deplorable;” and Indian National Security Adviser called it “barbaric.” Indian officials also summoned US Ambassador Nancy Powell, took away US diplomats’ identification cards that gave them diplomatic benefits, and removed security barriers outside the US Embassy in New Delhi. 3) Meanwhile, according to April 23, 2018 article in Bridges for Peace, the European Parliament called for the immediate and unconditional release of the Israeli citizens, and for the retrieval of the Israeli soldiers’ bodies held in Gaza. The EU Resolution made no reference to i) the remains of 261 Palestinians still being held by Israel. Those are people who were killed in the line of duty and/or during midnight raids or at checkpoints for no reasons, thus denying their families the chance for proper burial and paying their respects. ii) The resolution also ignored the status of the 6,500 Palestinian political prisoners, among them 63 women and 350 children that Israel continues to hold, iii) Sadly the EU Resolution did not make a demand for the immediate and unconditional release of the two EU citizens Mostapha Awad and Salah Hamouri held in Israeli jails without charges. Why not? If you do not demand the release of your citizens held captive, who will? Please forgive me if I may sound I am lecturing you about diplomacy and international relations. It is obvious here that Israel is making a baseless accusation against this young man and is creating something out of nothing and that Belgium should be outraged. Don’t get me wrong, many football fans across Belgium don’t care that several of their football national team players are Muslims, including Belgian super star Morouane Fellaini, but they do care when their governments abandoned their fellow Muslims in a foreign country when s/he is in distress. My intent with this letter is to appeal to you in the name of fairness, justice and human decency to help put an end to the suffering of one of your citizens and to demand an immediate and unconditional release of him. 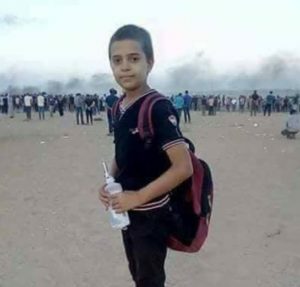 The soldiers killed Mohammad Ali Mohammad Anshassi, 18, and Nasser Azmi Misbih, 12, east of Khan Younis, in the southern part of the Gaza Strip. 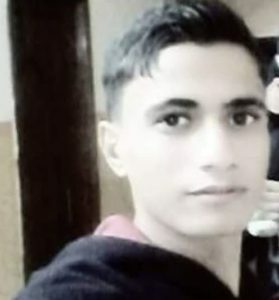 In Gaza city, Israeli army sharpshooters killed Eyad Khalil Ahmad Sha’er, 18, who was killed east of the city, Mohammad Bassam Shakhsa, 24, from the Sheja’eyya neighborhood, east of Gaza city, and Mohammad Waleed Haniyya, 24, from the Shati refugee camp. Their corpses were moved to the Shifa Medical Center, west of Gaza city. The protesters also managed to down an Israeli drone flying over the Great Return Camp, east of Rafah, in southern Gaza. The Israeli army said that some protesters flew flammable balloons, across the perimeter fence. The soldiers also fired several tank shells at observation posts, run by the al-Qassam Brigades, the armed wing of Hamas, east of Gaza city. On Friday afternoon, Israeli troops invaded the village of Nabi Saleh, known as one of the centers of non-violent resistance in the West Bank, and arrested three children – two of them age 11, and the other age 12. 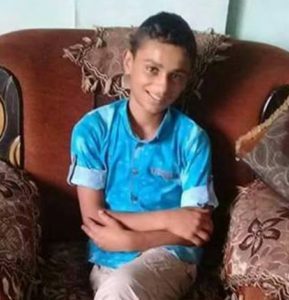 Samer Tamimi, 11 years old, the son of local non-violent activist Manal Tamimi, was kidnapped by Israeli soldiers along with two other children: Mohammad Abdul Lateef Tamimi, 11, and Ahmad Tamimi, 12, years old. The children were abducted by the soldiers and taken to an unknown destination without any attempt by the soldiers to communicate with the parents of the three boys. The abduction of children by Israeli soldiers is a common practice of the Israeli soldiers, with children as young as six years old grabbed and brutalized by the soldiers, taken to military bases, and interrogated for hours with no adult or advocate present. According to the group Defense for Children International, around 500-700 Palestinian children are arrested, detained and prosecuted in the Israeli military court system each year. The majority of Palestinian child detainees are charged with throwing stones, and three out of four experience physical violence during arrest, transfer or interrogation. 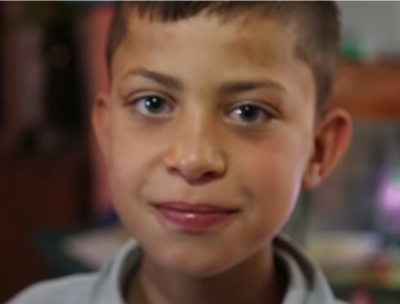 No Israeli child comes into contact with the military court system. The majority of children are detained from their West Bank homes during the middle of the night by heavily armed Israeli soldiers. Several hours after their arrest, children arrive at an interrogation and detention center alone, sleep deprived and often bruised and scared. Interrogations tend to be coercive, including a variety of verbal abuse, threats and physical violence that ultimately result in a confession. Unlike Israeli children living in illegal settlements in the West Bank, Palestinian children are not accompanied by a parent and are generally interrogated without the benefit of legal advice, or being informed of their right to silence. They are overwhelmingly accused of throwing stones, an offense that can lead to a potential maximum sentence of 10 to 20 years depending on a child’s age. 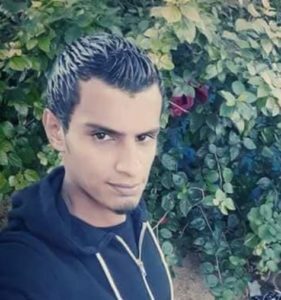 Samer has two older brothers, Mohammad, 19, and Osama, 22, who have been incarcerated for months in Israeli military prisons under so-called ‘administrative detention’, with no charges filed against them. The International Court of Justice on Friday said it has received a complaint from the “State of Palestine” against the United States, arguing that the US government’s placement of its Israeli embassy in Jerusalem violates an international treaty and it should be removed, Reutersreports. The ICJ is the United Nations’ venue for resolving disputes between nations. Palestine was recognized by the UN General Assembly in 2012 as a non-member observer state, though its statehood is not recognized by either Israel or the United States. Hamas on Friday said the Al-Aqsa Intifada, which lasted from 2000 to 2005, had revealed the “futility” of pursuing peace talks with Israel, Anadolu Agency reports. In September 2000, a visit to Jerusalem’s Al-Aqsa Mosque compound by controversial Israeli politician Ariel Sharon sparked what later became known as the “Al-Aqsa Intifada”, a popular uprising in which more than 4,000 Palestinians were killed. In a statement issued to mark the 18th anniversary of the outbreak of the uprising, Hamas stressed its “right to resist the Israeli occupation”, noting that “all laws and norms give a people under occupation the right to resist their occupiers”. Hamas also stressed its rejection of the so-called “Deal of the Century”, a backchannel US Mideast peace plan. “Hamas reiterates its rejection of the ‘Deal of the Century’ or any regional peace plan that impinges on the rights — legal or national — of the Palestinian people,” the statement read. For the last several months, top officials from the US administration have been speaking to leaders in the region with a view to hammering out a landmark Middle East peace deal. Although details remain vague, it is believed that the plan includes several clauses favoring Israel, such as leaving East Jerusalem — and most Jewish-only West Bank settlements — in Israel’s hands. Hamas also blasted Trump’s decision last year to recognize Jerusalem as Israel’s capital. “The Palestinian people do not recognize Trump’s decision [to relocate the US embassy from Tel Aviv to Jerusalem] and totally reject any change to Jerusalem’s historical or legal status,” the statement read. Hamas also blasted the Ramallah-based Palestinian Authority (PA), accusing it of “protecting the [Israeli] occupation”. “The PA must stop protecting the occupation and side with the Palestinian people, who prefer freedom, dignity and resistance,” the movement asserted.